TWT Prospero is the kind of typeface you seldom find in blocks of continuous text these days. Similar faces based on late-18th-century work by Bodoni, the Didots, and others tend to be reserved for display type: their exaggerated contrast and vanishing hairlines can make you squint and strain at small sizes. 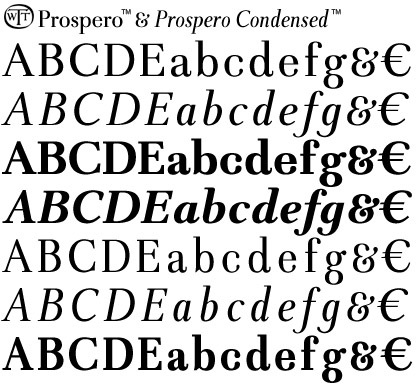 But TWT Prosperowith its moderate contrast and fairly robust hairlinesis impressively legible in book text while remaining ideal for use in display situations. The full family has seven styles: regular, italic, bold, bold italic, condensed regular, condensed italic, and condensed bold. US$129.